The cloud computing world is in for yet another shakeup: Red Hat (s rht) has acquired platform-as-a-service (PaaS) startup Makara. The purchase immediately vaults Red Hat into the role of cloud provider (Makara offers an on-demand service hosted atop Amazon (s amzn) EC2), but, more importantly, gives Red Hat the means to sell its PaaS vision across the cloud landscape. Red Hat’s cloud strategy has been about choice since the beginning, and Makara is icing on the cake. Makara is widely cited as a JBoss PaaS provider, but that’s not entirely accurate. It actually specializes in JBoss and PHP applications, but also supports standard Java EE, Spring and Tomcat, as well as LAMP. According to Red Hat’s Bryan Che, the company won’t change the current focus on JBoss and PHP, and actually will expand integration between Makara and other components of the JBoss portfolio. This isn’t a surprising plan at all, given that Red Hat bought JBoss in 2006, and it actually mirrors Microsoft’s Windows Azure (s msft) approach of providing an optimal platform for .NET while supporting a variety of alternative languages. But unlike Windows Azure – or any other popular PaaS offering, for that matter – Makara isn’t relegated to running in any particular environment. Yes, the service is hosted atop Amazon EC2, but Makara customers can implement the platform atop pretty much any virtualized infrastructure. Che said that includes Red Hat Enterprise Virtualization-, Xen, or VMware-based (s vmw) internal or public clouds, as well as internal IaaS software such as Eucalyptus or Cloud.com’s CloudStack. Makara can serve as the platform for hybrid cloud environments, too. As I pointed out yesterday while reporting on CloudBees’ funding for its Java PaaS offering, the Java PaaS space is getting crowded. Makara is a meaningful player made even more formidable with the addition of Red Hat’s financial backing and strong product lineup to tie into. Apart from JBoss middleware at the platform level, Red Hat has positioned Red Hat Enterprise Linux and Red Hat Enterprise Virtualization as core infrastructure building blocks, along with various systems management products and its open-source Deltacloud API. 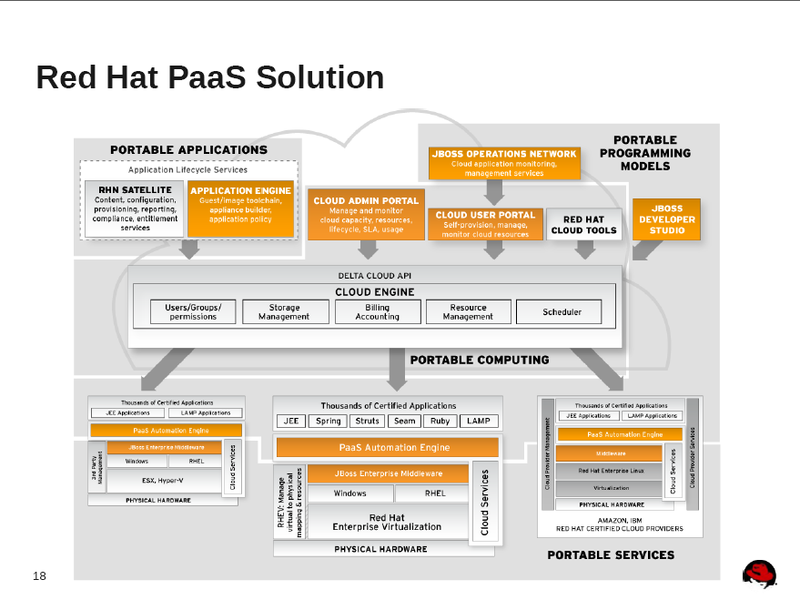 It recently packaged these components, along with consulting services, into the Red Hat Cloud Foundations portfolio. In true PaaS form, Makara adds a layer of automation and abstraction above all these lower-level components. Microsoft and VMware probably have the most to fear from Red Hat’s ceaseless cloud push, because they’re the only other large software vendors targeting both internal and public IaaS and PaaS, and they’ve both been cited for promoting lock-in to some degree. Even without the addition of Makara, JBoss already supports, according to Red Hat, “PHP, Perl, Python, Ruby, OCAML, C/C++, Java (s orcl), Seam, Hibernate, Spring, Struts and Google Web Toolkit applications,” and the Deltacloud API gives users basic management capabilities across pretty much every major public infrastructure cloud. This means Red Hat customers seeking IaaS have a large degree of choice in terms of how they develop and where they deploy their applications. On the contrary, VMware’s PaaS strategy is tied to Spring, and its IaaS strategy is tied largely to vCloud. Microsoft’s public PaaS and IaaS strategies are both tied largely to Windows Azure, while its somewhat disconnected internal strategy revolves around its System Center management product. Of course, VMware will correctly tell you there’s definite value to be had by running Spring applications on either VMware-based internal clouds or Google App Engine and Force.com (s crm), and Windows Azure is a PaaS standout in its own right, lock-in concerns or not. VMware’s Cloudy Ambitions: Can It Repeat Hypervisor Success? With this acquisition Red Hat has entered into Cloud Arena…interesting. Let’s wait & watch.